Scientists at Tokyo Institute of Technology and their team involving researchers of JASRI, Osaka University, Nagoya Institute of Technology and Nara Institute of Science and Technology have just developed a novel approach to determine and visualize the three-dimensional (3-D) structure of individual dopant atoms using SPring-8. The technique will improve the current understanding of the atomic structures of dopants in semiconductors correlated with their electrical activity and thus support the development of new manufacturing processes for high-performance devices. 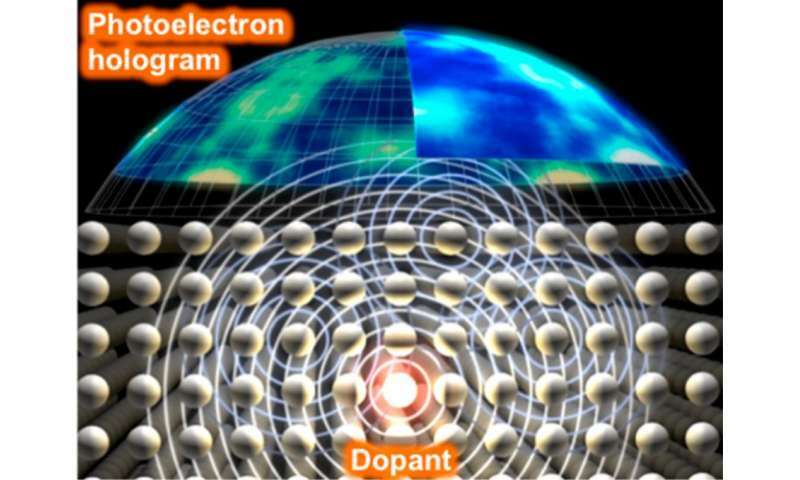 Using a combination of spectro-photoelectron holography, electrical property measurements and first-principles dynamics simulations, the 3-D atomic structures of dopant impurities in a semiconductor crystal were successfully revealed. The need for a better understanding of the atomic structures of dopants in semiconductors had been long felt, mainly because the current limitations on active dopant concentrations result from the deactivation of excess dopant atoms by the formation of various types of clusters and other defect structures. The search for techniques to electrically activate the dopant impurities in semiconductors with high efficiency and/or at high concentrations have always been an essential aspect of semiconductor device technology. However, despite continuing developments, the achievable maximum concentration of active dopants remains limited. These important structures had been previously investigated using both theoretical and experimental approaches. However, direct observation of the 3-D structures of the dopant atomic arrangements have hitherto been difficult to achieve. In this study, Kazuo Tsutsui at Tokyo Tech and colleagues developed spectro-photoelectron holography using SPring-8, and leveraged the capabilities of photoelectron holography in determining the concentrations of dopants at different sites, based on the peak intensities of the photoelectron spectrum, and classified electrically active / inactive atomic sites. These structures are directly related to the density of carriers. In this approach, soft X-ray excitation of the core level electrons leads to the emission of photoelectrons from various atoms, whose waves are then scattered by the surrounding atoms. The resulting interference pattern creates the photoelectron hologram, which may then be captured with an electron analyzer. The photoelectron spectra acquired in this manner contain information from more than one atomic site. Therefore, peak fitting is performed to obtain the photoelectron hologram of individual atomic sites. The combination of this technique with first-principles simulations allows the successful estimation of the 3-D structure of the dopant atoms, and the assessment of their different chemical bonding states. The method was used to estimate the 3-D structures of arsenic atoms doped onto a silicon surface. The obtained results fully demonstrated the power of the proposed method and allowed confirmation of several previous results.